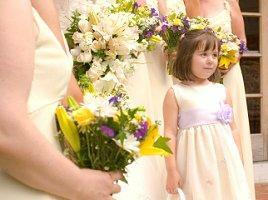 Having a flower girl as part of the wedding party dates back to the Victorian Era. The original intention was to use her as a way to provide entertainment to guests who would oooh and aah as she walked down the aisle. These days her main purpose might not be to entertain, but guests are still delighted when she walks before the bride. She is generally between the age of three and eight. Keep in mind however, that the younger she is, the less likely she is to stay focused. Young children are unpredictable, when choosing a three to five year old you may be subject to fidgeting or even a tantrum. While most of the time there is nothing to worry about, you should be prepared for all likelihoods. You may need to rehearse the processional and even the ceremony several times so she knows what's expected of her. Her appearance signals the bride's arrival. She is to walk behind the Maid of Honor, but before the bride. In most cases, she'll strew flower petals along the aisle for the bride's service. If there is a ring bearer, she will be expected to walk down the aisle at his side. She will also appear in wedding photos, and if the bride and groom wish, will be announced by the disc jockey at the reception and take part in the first dance. Her attendance at the reception is not mandatory, however. While most of the bridal party is expected to stand at the bride's side during the ceremony, it's rather unreasonable to expect a young child to do so, especially if it's a long ceremony. Designate one of the bridesmaids to keep an eye on her and hold her hand if needed. If she starts fidgeting or misbehaving, the bridesmaid should bring her to her parent's pew, where she should sit for the duration. She's not required to walk back up the aisle in the recessional. It's up to you whether or not you want children attending your reception. It's perfectly acceptable to have her attend the ceremony but not the festivities afterwards. Once again, keep in mind the child's age. There's a good chance young children will act up during the reception. If you'll be providing a baby sitting service for guests with young children, she could play with the other kids when not having her picture taken or being announced by the disc jockey. In most cases she will wear a miniature version of the bridesmaids' dresses. If the dresses are too grown up, sweeter versions are available for youngsters. If no matching version is available, you can consider a less expensive dress in the same color. Many brides would rather she wear white as a symbol of sweetness and purity. If you're going this route keep in mind that some guests may not approve of her looking like a "mini bride." White tights and age appropriate shoes can also be worn. Ballerina flats or Mary Janes dyed to match the dress are a good choice. Jewelry should be simple and age appropriate as well. Nothing clunky or distracting. If you like, you can place a wreath of flowers, straw hat, or pretty bun wrap atop her head. Most flower girls carry a basket for their flower petals, or, if they won't be scattering petals, a small simple bouquet or kissing ball will do. Will you have a flower girl in your wedding? Do you have a story to share? Let us know in the comments section.